If you have a teenage boy in the family, you may understand the following. If not, please enjoy this researched, significantly adapted and tested recipe of Hispanic origin. Son: I have an assignment due tomorrow in Spanish. I have to bring in a prepared recipe of hispanic origin. Me: When are you making it? Son: I have 2 finals I have to study for tonight after presenting a research project to the sophomore class and faculty before sailing practice after school. Me: When are you helping me make it? Son: After my homework and before bed, probably not before 11 pm – if I haven’t fallen asleep. Me: What am I making? Son: I found this recipe on the internet for Cuban Carne Asada with Oranges that sounds good. Me: Yes it sounds good. In fact what makes it so good is that it requires at least 3 hours to marinate and another 3 hours to slow-cook. Son: Is there a quick version? Me: That is the quick version. It tastes better if it marinates overnight. Son: I will help you as much as I can. I promise. This recipe sounds really good. Me: (Saying) Please learn to manage your time more efficiently – you are lucky that cooking is part of my job description. (Thinking) I am so happy you can spot a great recipe worth making. Epilogue: A double batch was prepared with a healthy dose of adaptation and improvisation. My son chopped the garnishes and washed the dishes. Everyone in the class loved the recipe, and we enjoyed it for dinner. Cut beef chuck in 3 inch pieces. Salt and pepper on all sides. Place in a bowl or container. Add garlic, onion, olive oil, cumin, orange juice and zest. Turn the beef to coat with marinade ingredients. Cover and refrigerate at least 3 hours or preferably overnight. Heat 2 tablespoons olive oil in a deep skillet or pot. Add beef in batches in one layer without overcrowding. Brown on all sides. Transfer to a plate and repeat with remaining beef. Pour wine into the pan to deglaze. Return beef. Add orange juice. Cover and simmer, occasionally basting with juices, until beef is very tender and easily falls apart, about 3 hours. Transfer beef to a plate. Boil pan juices over medium-high heat until reduced and thickened, about 20 minutes. Add salt and freshly ground black pepper to taste. Shred beef and return to pot; keep warm. 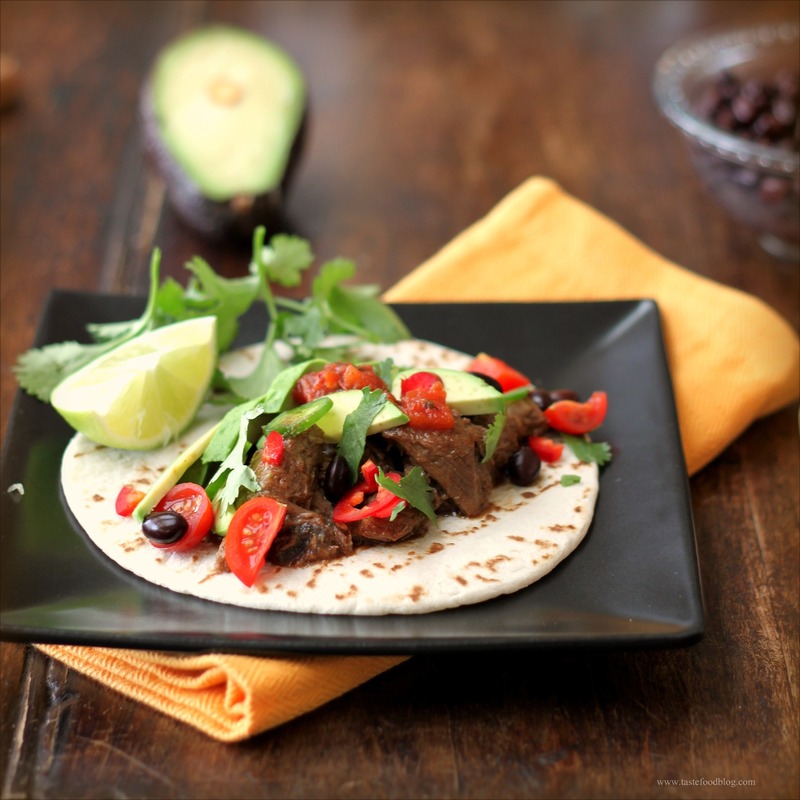 To serve, spoon some of the beef over a warmed tortilla. Top with optional garnishes, such as salsa, fresh avocado, jalapeno peppers, black beans, cilantro and freshly squeezed lime juice. I enjoyed the narrative almost as much as the recipe. I bet your kids have an amazing repertoire, Steve. Reading this makes me very curious about what my 18 month old will be like in 18 years. What fun to think about. Since the first thing I ever put in his hand was a wooden spoon, I hope that indicates he’ll love to eat…. Nice recipe. Love the dialogue (and the time line)–I can truly appreciate that! The recipe sounds delicious! This made me laugh out loud! I was not even a third as responsible as a teenager. I’m kind of impressed. And let’s not forget about this recipe! Amazing. I actually have all of the ingredients for the beef on hand. Searching for my favorite-looking version of Cuban Beef in Orange to make for No Reservation’s visit to Cuba tonight, I chose your recipe mostly for the narrative! I’m a mother of 3, and have many times been told at 8pm, “Mom, I need 27 cupcakes tomorrow morning for school. I told my teacher you would do it because you don’t work.” 😛 This recipe is marinating away in my fridge, and to allow a longer soak I’ll cook it in my pressure cooker. I’ve used toasted cumin seeds instead of ground, and I added a sliced chile. Hope all works out, will be sure to post an update here after dinner! Toasted cumin seeds and chile sound great! THAT was great. Thanks for the inspiration! 🙂 I also made http://simplyrecipes.com/recipes/easy_black_beans_and_rice/ from another blog that I just adore. Awesome dinner! !